Straight Outta Compton review by Teejay McFly! The story of NWA is something that I have already known about my whole life. I didn’t learn anything new because I grew up a fan. My mom was 16-19 when NWA first came out, so this was pretty much her era. And I’m sure most of you remember growing up listening to the music your parents listened to. My childhood was full of NWA. I knew the words to “Boyz N The Hood” at 5-6yrs old, before I even knew simple math. To see the story told in a such a beautiful way on screen is magical. You see the rise and fall to one of rap’s most beloved and storied groups. 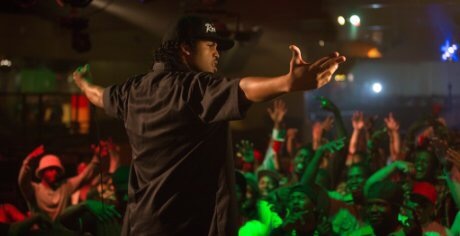 The film opens up in Compton, CA with Eazy-E at a crack house during a drug deal gone bad, which gets even worse when the LAPD come and raid the house. First off, the actual film opens up with the famous Dr. Dre quote “You are now about to witness the strength of street knowledge”. NWA fans know right away that this is the first thing you hear when you start the Straight Outta Compton record/cd/tape. I thought that was pretty cool. It got me more excited than I already was. From there you meet Dr. Dre(who moves out of his home due to an argument with his mom), and Ice Cube(who is constantly writing his rhymes in his notebook). 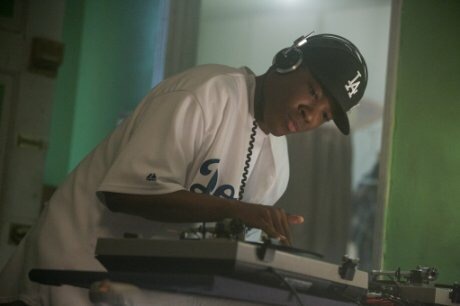 Dre is a DJ who spins at a local club(along with DJ Yella), but isn’t spinning the music that he really wants to play. Dr. Dre than brings out Ice Cube on stage who than performs a rendition of “Gangsta Gangsta”. Eazy-E and MC Ren(a rapper and friend of Eazy-E) are in the crowd watching all of this take place. After the performance, Dre see’s his friend Eazy-E and they talk about potentially putting money into a studio for them to record music. With a song that Ice Cube has written, the guys have a group of rappers try to rap the lyrics to which they disagree with. With Eazy-E already spending the money for the studio time, the rest of the guys all pick Eazy to rap the song. Only problem is, he is not a rapper. He tries numerous times to do one line, but just can’t do it. Dre tell Eazy to “feel” the lyrics, to which Eazy puts his black shades on – and the song “Boyz N The Hood” is born. Of course you know how the story goes, NWA is born from that hit single and the rest is history. The timeline for music fans go from the birth of NWA all the way to the beginning of Aftermath. Yes, that’s a long time. We see other faces we’ve known all our lives(if you are a fan of rap) along the way. I don’t want to spoil some because it’s a great treat for the audience. The attention to detail in this movie is unbelievable since I have personally seen interviews from years back from Ice Cube and Dr. Dre about what we are now seeing on screen. My personal favorite scene takes place after Ice Cube leaves NWA and records “No Vaseline” to which the guys are shocked. That song is just crazy! From what I’ve heard, the casting for this movie alone took two years. I can see why, the casting is nearly perfect. Look, you will never be able to 100% get a guy that looks like someone, but that doesn’t mean it isn’t great casting. The actors who play DJ Yella and MC Ren don’t talk as much as the other three stars, but I’m sure it’s because they are the less known. 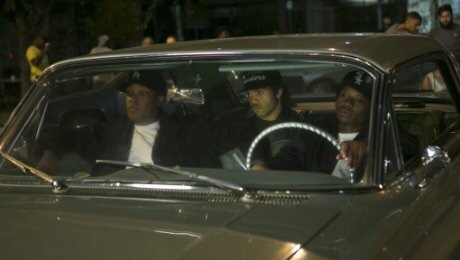 The three main characters are Eazy-E(Jason Mitchell), Ice Cube(played by his son O’Shea Jackson Jr), and Dr. Dre(Corey Hawkins). The one who steals the show in my opinion is Jason Mitchell. I really felt like I was really watching Eric Wright on the big screen. Paul Giamatti does a fantastic job playing manager Jerry Heller. This is the second time he’s played a shady manager this summer in a musical biopic(Love and Mercy). Overall, the whole cast does a fantastic job in Straight Outta Compton. And with a movie like this, that might be the most important thing. You will laugh, you will dance, if you know the words you will rap along, and you may even cry. Straight Outta Compton is not just only a great musical biopic, it’s an excellent movie in general. With Dr. Dre and Ice Cube on as producers, expect the film to be as accurate as it possibly can. I think I may just go to the movies one more time to relive the whole experience again. I give Straight Outta Compton a 9/10. ← Official trailer for Quentin Tarantino’s The Hateful Eight!